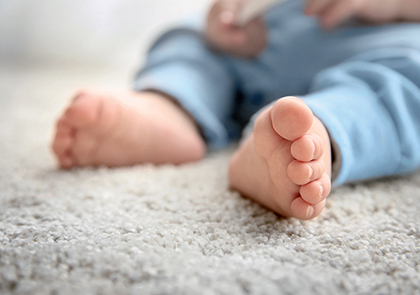 Carpet has this advantage over other floor coverings: it offers unrivalled all-round comfort. It is, above all a sensory product. The first thing you will do when you see a carpet is to touch it, to run your hands over the velvety pile and imagine standing on that soft surface in bare feet. Carpet has the advantage of offering visual, tactile and aural comfort at the same time. It is not by chance that carpets are associated with luxury, for example in hotel rooms and casinos. Carpet retains heat more effectively than other surfaces. The heat is trapped in the pile, which retains 10 to 12% more heat than a hard floor. This also brings the added comfort of being able to reduce energy consumption ; helping save money and the environment! Another advantage of carpet is the wide range of colours and designs on offer: a substantial choice of designs, textures and colours lets you express your personality and lets your interiors make a statement. And finally, thanks to its colour ranges, carpeting can promote happiness and well being (chromotherapy). Take the plunge into our sensory world!